Some people dream about flying. Others dream about work. I dream about food. Literally! 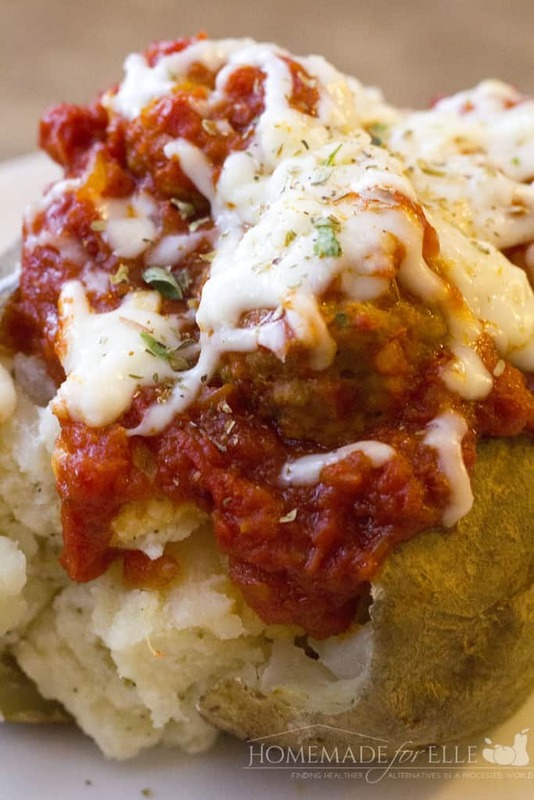 This morning, I had a dream about a baked potato, mixed with ricotta, topped with meatballs, marinara and mozzarella cheese. I had the most vivid picture of it in my head when I woke up, I could almost smell and taste it. When I woke up, I was hungry!! I decided I was going to make my dreams a reality, and bring that idea to life! I started with a baking potato, put it in the oven for an hour @ 350, until it was nice and soft. While I was waiting for the potato to bake, I made meatballs! I took two pounds of ground beef, added breadcrumbs, an egg, grated asiago cheese, and spices. Those went into the oven for about 20 minutes, along with the potato, and made my home smell all sorts of amazing. My picky eating 5-year-old walked into the kitchen, on 3 different occasions, and told me how great it smelled! Once the meatballs were done, I sauteed fresh onions and garlic, then poured in a can of crushed tomatoes, a couple tablespoons of tomato paste, a little olive oil, and spices. I let that simmer 20 minutes, before adding in the meatballs, and letting it simmer. When the potato was done, I split it down the middle, scooped out all of the potato, then mixed it with ricotta cheese, salt, pepper and oregano. I then spooned all of the ricotta potato mixture back into the potato skin. I spooned meatballs and marinara sauce on top of the potato, then sprinkled on freshly shredded mozzarella cheese. I popped it back in the oven a couple minutes to melt, and the rest is history! You could streamline this dish by using pre-made sauce, or frozen meatballs, if you’re short on time. 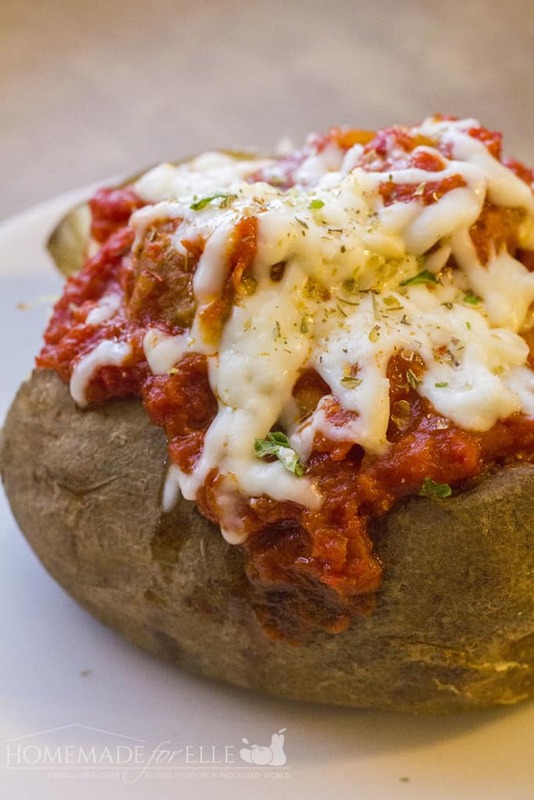 I hope you try this meatball stuffed baked potato. I hope it fills your home with a warm and delicious scent. I hope it fills your belly with happiness. Preheat oven to 350 degrees. Wash your baking potatoes well, then place on a piece of aluminum foil. Pierce a few times with a fork or knife. Rub a little olive oil on the outside of the skin, and sprinkle on a little salt and pepper. Wrap up in foil, and bake in preheated oven for 1 hour, or until soft. Remove from oven, slice down the middle, and scoop out the inside of the potatoes to a bowl. Mix in ricotta cheese, oregano and salt and pepper to taste. Stir well, then transfer back to potato skins. To a large bowl, add ground beef, breadcrumbs, eggs, onion, garlic, asiago (or parmesan) cheese, salt and pepper. Mix well. Form into balls about the size of a golfball. Place onto a baking sheet, and bake in 350 degree oven, preheated oven, for 15-20 minutes, or until cooked through. Warm 2 tbsp of olive oil in a large pan. Add in onions and garlic, and saute until fragrant, 5-8 minutes. Add in crushed tomatoes, tomato paste, remaining 2 tbsp of olive oil, sugar cane, oregano, salt and pepper. Simmer, stirring frequently, for 20 minutes. Once meatballs are cooked, transfer into the tomato sauce, stir, and reduce heat to simmer. Spoon 3 - 4 meatballs, and desired amount of sauce onto the baked potato. Sprinkle on shredded mozzarella cheese. Return to 350 degree oven for a minute, to allow cheese to melt. Hungry for more? Try my amazing recipe for white pizza with spinach and bacon! Wow! So I had a dream about meatball stuffed potatoes and woke up ready to cook them then I found this recipe and saw that you dreamed of them too. Amazing. This would make a nice change from our regular taco meat on a baked potato. Changing things up now and again is the spice of life. I never thought of it this combo. 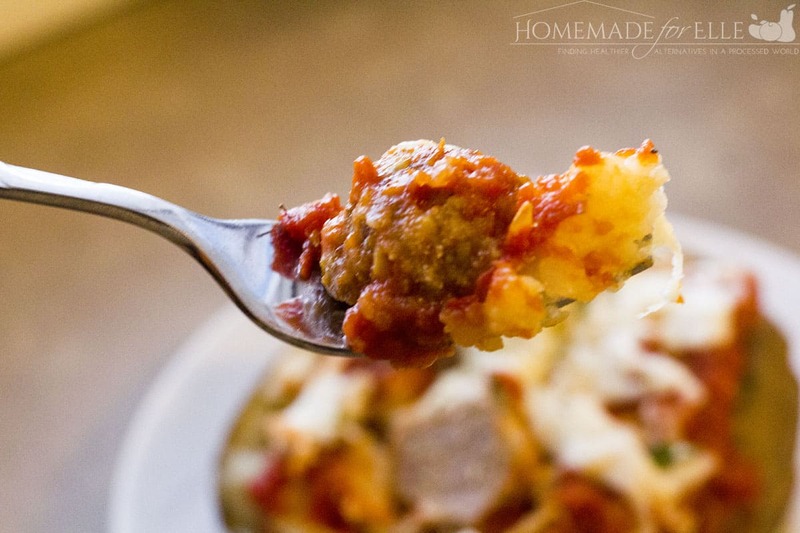 It is almost like gnocchi with meatballs so it makes delicious sense! You have the best dreams! Your family must be very appreciative. This makes the Italian in me VERY happy! This is going on the menu this week!